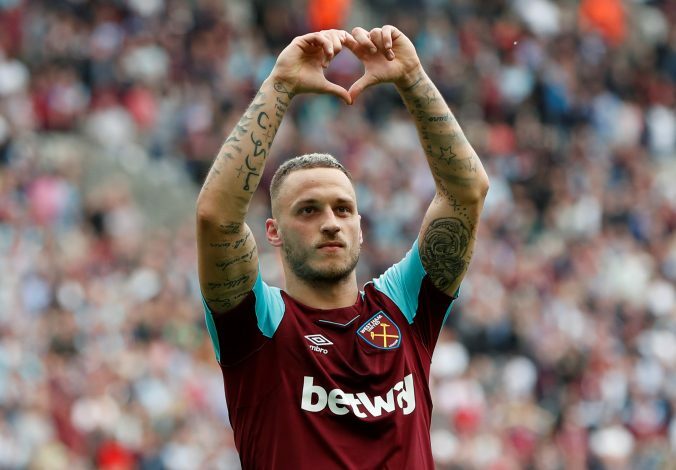 Manchester United have been on the hunt for a signing to change their fortunes since a while now, and a name that has consistently been a part of this list has been Marko Arnautovic. The West Ham attacker has been a target for the 13-time Premier League champions for months, and according to recent reports, the move could all boil down to the time Jose Mourinho has remaining as the manager of the club. West Ham fans have been worried sick since the rumours starting making the rounds on the internet, and the approaching January transfer window does not ease that feeling. Since arriving at the London club in 2017, the striker has been banging in a good number of goals, and is one of the most crucial players for Manuel Pellegrini and his plans for the future. The player does offer a new dimension of aerial abilities along with pace and power, making him a target for many clubs on the continent. However, him being prone to injuries and a having a tendency of losing his cool every now and then, does add a slight risk into pursuing him. With him being priced at £50 million and being 29 years already, many could also argue that this deal is unlikely to reach a happy conclusion. However, recent reports from the Telegraph suggest that Jose Mourinho’s future at Manchester United is to play the biggest part in Arnautovic’s decision to whether or not join the Red Devils. The Mancunians are desperate for a new name to spark life into them, and West Ham are keen to keep hold of their main man, making this transfer battle an interesting one to look forward to.